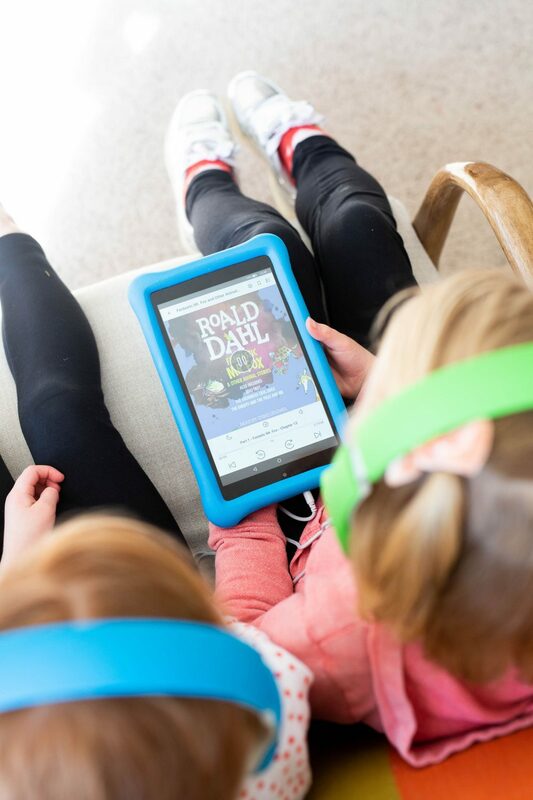 Every time I write a post about audiobooks for children, I get dozens of questions about HOW my children listen to audiobooks. I wrote a full post about the devices we use here, and since one of those devices is a tablet, there are always concerns about setting your child up to listen to an audiobook only to discover an hour later that they’re actually playing games or watching videos on YouTube. Not what you had in mind when you turned on The Trumpet of the Swan. 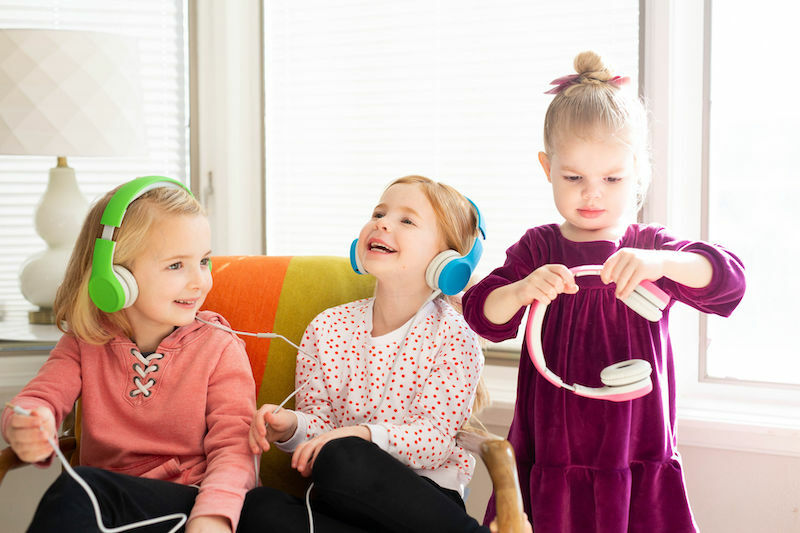 If you’re worried about this too, here are five ways to keep your child safe while they listen to audiobooks. CD Player. The easiest way is to skip the tablet all together and go old school with a CD player. Each of my girls has a basic CD player that I just picked up at Target or Walmart. I always get the cheapest one on the shelf and many of my readers have also suggested picking them up at a second-hand store like Goodwill or Salvation Army or checking out garage sales, since many people still have working ones that they no longer use. All of my girls have learned how to use a CD player when they were about 3 and have no trouble putting a CD in and pressing play. Here are some of my favorite books on CD for those 3-4 year olds. Guided Access. If you’re using an iPhone or iPad, you can turn on Guided Access which means the device will stay locked in whatever app you’ve turned on and you can even turn it so that the screen won’t respond to touch either. We have used this when we do road trips and our toddlers won’t stop touching the screen and getting out of their movies, and it’s a life saver. There’s a full tutorial for how to turn guided access on and use it here. Lock the Screen. Because audiobooks don’t require you to be looking at the screen, there’s no reason to have the device unlocked while they listen. You can turn the audiobook on and then just lock the screen and it’ll keep playing (in the same way that you don’t need your phone unlocked to listen to a podcast). Even from the lock screen they can still pause or unpause if they need to, adjust the volume or even jump 30 seconds forward or back. Use a Bluetooth Speaker. 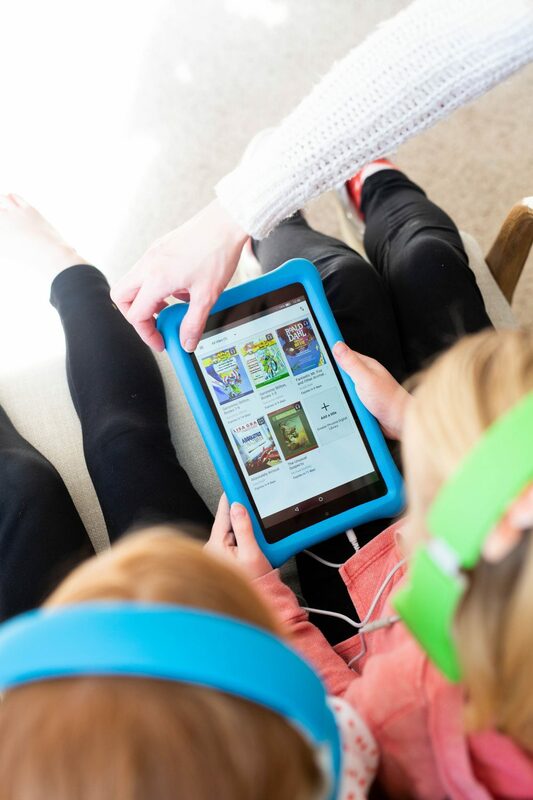 If you have an Amazon device (an Echo or Echo Dot for kids), you can use it to play your Audible collection or podcasts (this and this are our favorite podcasts for kids) without any screen at all. Just say “Alexa, play Frog and Toad All Year on Audible” and boom – it’s playing. Or if you have another bluetooth speaker, like a Google Home, you can just stream from your phone to that and your child can listen without needing a screen. Bluetooth Headphones. Similarly, you can use Bluetooth headphones so the screen can be in a completely different room or out of reach of your child and they can listen through their headphones. 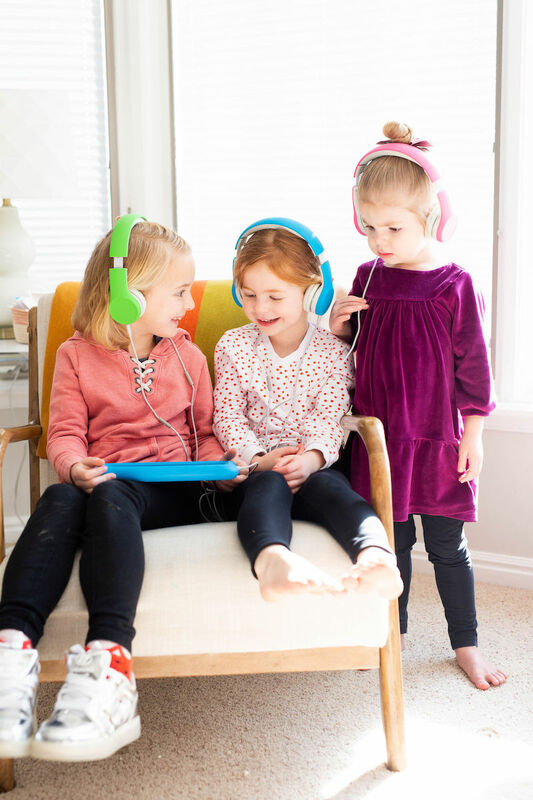 We have these kids headphones (we gave each of the three big girls a pair for Christmas) which we’ve loved and I especially like that you can connect multiple pairs to each other so they can all listen to one device at once. That same brand also makes really highly rated bluetooth headphones for kids. If you liked this post, you might also find these posts about audiobooks for kids helpful!